Anyone with a pet knows that they need to have a portable carpet cleaner close at hand to deal with any potential messes. After all, no matter what type of pet you have, you’re going to have a big mess to clean up at some point in time. And more often than not, you are going to need a carpet cleaner that’s not only powerful but is portable enough to be carried where it is needed. However, it’s not always easy to find the “best” model available, because there are at least a dozen different brands claiming that they have the best model. That’s why we’ve decided to do our own research and cut through all of the marketing hype to find the model that’s truly the best portable carpet cleaner available. A model that’s not only portable but also quite powerful as well. And we’ve listed our top ten favorites below. This portable cleaner is suitable for cleaning a variety of stains from all different types of carpet. It can be used on low-pile carpet or on shag carpet and can also be used just as well on upholstery. This cleaner has a 12-ounce dirty tank capacity, so it can do a fair amount of cleaning before it has to be emptied and refilled again. This cleaner also has a manual spray trigger that gives the user control over how much cleaning solution is dispensed, and it has a removable brush cartridge that’s easy to use and easy to clean. And since this carpet cleaner has an 18-foot power cord, it can be taken directly to the stain without having to use extension cords. Weighing around 15-pounds, and equipped with a 5.5-foot hose and an easy-to-carry handle, this carpet cleaner can easily be carried to just about any location and used to clean even the toughest of messes. This machine can hold up to 64-ounces of cleaning solution and has a motorized brush capable of performing 1,200 movements a minute. This feature, along with its increased suction, enables it to extract stains quickly and effortlessly. Other features which can be found on this machine include wheels which allow it to be pulled, has a clearly marked water tank, and has a compact design. With two removable water tanks, one for clean and one for dirty water, the Hoover Spotless Carpet Cleaner is designed to handle a number of stains. This machine has a 3.5-Amp motor that allows this tool to spray, scrub and remove a variety of stains, including pet stains. It weighs approximately 9-pounds and is equipped with self-clean technology that allows it to remove dirt and bacteria from its cleaning hose. Although it’s not a professional level extractor and doesn’t remove large stains, it does do a fairly good job with most small, ordinary stains that often happen around the home. Although this high-quality steam cleaner isn’t as portable as other models, it does do a great job at not only removing stains from carpets but also from a variety of other surfaces as well. It has a 48-ounce water tank that heats up in under 10-minutes and delivers up to 45-minutes of steam. It also comes with a 15.7-foot power cord and a 9-foot steam hose, so it can be used to reach stains just about anywhere. This steam cleaner also comes with 18-different accessories which include a floor mop, nylon brushes, a brass brush, squeegee, and a scrub pad. The SpotBot Pet 33N8 has an automatic cleaning cycle which can be used to clean a variety of different stains out of carpets. This is due to is a unique brush that can perform over 400-cleaning revolutions per minute, which loosens up even stuck-on stains in no time flat. This unit also has antimicrobial product protection built right into it, which means that it resists bacterial growth that can lead to it smelling bad and it’s also resistant to mold and mildew. Although this unit is a bit heavier than some of the other portable units available, it does do a good job at removing stuck-on pet stains. This cordless model is designed to clean messes anywhere, even places that corded models can’t reach. That’s because it has a lithium-ion battery that allows it to be used without a power cord and to give the user approximately 15-minutes of cleaning time. Another advantage that this unit has over other portable carpet cleaners is that it’s extremely lightweight, weight under 5-pounds. This prevents the unit from exerting to much wear on the user’s arm. Other advantages of this cleaner include separate clean and dirty water tanks, powerful suction and a removable nozzle that makes it easy to clean. The Bissell Spot Clean is a carpet cleaner which can deliver professional quality results. It can not only be used on carpets but can be used on stairs and upholstery as well. It has a 5-foot flex hose that can reach stains in hard to reach areas and has both a 3-inch tough stain tool and a 6-inch stair tool. This machine has a 5.7-Amp motor and has a tank capacity of approximately 3/4th of a gallon. All of these features combined allow this machine to tackle just about any stain, regardless of whether it’s a pet stain or if it’s red wine, coffee or some other hard-to-clean stain. This handheld steam cleaner can clean just about any surface using only the power of steam. It can clean not only carpets but can also clean hardwood floors, counters or any other surface which is suitable for steam cleaning. It comes with a 9.8-foot cord and has a 9-piece accessory kit with a variety of cleaning tools. This product heats up in 4-minutes or less and is easy enough for just about anyone to use. The best part about this cleaner, however, is that it can clean using hot steam and doesn’t require many of the harsh chemicals that other portable carpet cleaners may need to use. This portable spot cleaner can be used to remove a variety of different stains from carpets, and it can do it rather quickly. It has a 3-Amp motor that gives it enough power to do its job and has a 48-ounce dirty water tank capacity. This product also has a 4-foot hose and comes with a brush attachment for removing stuck on stains. With a weight of only 9.6-pounds and a power cord length of 15-feet, this carpet cleaner can be taken to the mess no matter where it’s located in the home. It’s a lightweight model that does the job it was designed to do and is small enough to fit inside of most utility closets. Although this carpet cleaner is a little more expensive than comparable models, it does clean carpets better than just about any other machine on the market. It works especially well on pet stains and has a number of features which allow it to do its job quite well. It has a powerful 5.7-Amp motor, a 22-foot long cord and has a 4-foot long hose. This product also has a large capacity tank which holds approximately 3/4th of a gallon of water. This carpet cleaner weighs approximately 13-pounds, so it can be carried anywhere, and it’s equipped with a 3-inch brush tool to power through tough upholstery stains. Although the easiest way to buy a portable carpet cleaner is to take a recommendation based upon someone else’s recommendation, if you truly want to find a portable carpet cleaner that’s best for your individual needs, then you are going to have to consider all of the features that a particular model has and then weigh those features against your own individual needs. To give you a guide that you can follow to find the best model for you, we’ve included some of the features we feel are important when you are considering a particular portable carpet cleaner. If you factor in the following features, then you will most assuredly find a model that fits your needs and gets your carpets as fresh as possible. 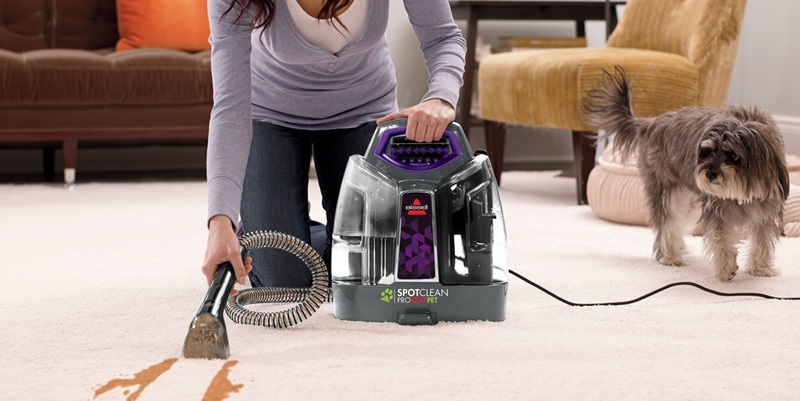 One of the first things that should be considered is the motor size of the carpet cleaner. Although there’s really no guidelines for how powerful a carpet cleaner’s motor should be, it’s important to choose one that’s powerful enough to get the job done. The minimum power that a portable unit should have is approximately 2-Amps, although one that’s over 4-Amps is more desirable. However, it’s also important to consider that the more powerful the motor, the larger it will be. And a larger motor means that the unit will be heavier. Tank capacity is another important consideration. The larger a machine’s tank, the less it will have to be emptied and refilled. Therefore, it’s important to consider a model with a good size tank. As was the case with motor size, however, the larger the tank on the unit the heavier it’s going to be to carry after it’s been filled. A portable carpet cleaner should also have a decent-size hose, at least one long enough to reach the messes that need to be cleaned. In most cases, this is approximately 3 to 4-feet long. A long power cord is also an important feature because not all messes are near an electrical outlet. Most of the better portable carpet cleaners have a power cord that’s 15-feet or longer. Portable models come in all sizes, and some are lighter than others. 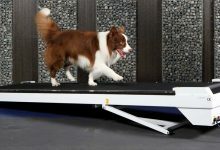 Some models are as light as 9-pounds, and other portable models are in excess of 13-pounds. If the carpet cleaner is much bigger than 13.5-pounds, then it ceases to be within the portable category. Powered brushes are always a useful tool for cleaning up stubborn messes. There are some powered brushes which have to be manually held over the stain for them to do their job, and there are other types of brushes which have presets that enable them to work automatically. Although neither one of these features are absolutely necessary for a carpet cleaner to do its job, they do make the job a whole lot easier. Models with these features are a little more expensive, but in the long run, they’re often worth it. Although most of the portable cleaners we like are conventional models, there are a few steam-powered models that do a really good job. Although conventional carpet cleaners do a better job at cleaning carpet stains, steam-powered models can be used on a variety of different surfaces. Steam-powered models also tend to have more accessories than carpet cleaning models. Regardless of whether you’re using a conventional portable carpet cleaner or are using one of the steam-powered ones, you are going to probably want to use a great cleaner with your machine. Although most models have their own proprietary cleaning solutions that can be used with their machines, sometimes machines need a little bit more cleaning power to finish the job off. Below are some homemade cleaning solutions which can be used on tough pet stains. A paste made out of one part hydrogen peroxide and one part baking soda can do a great job at getting rid of most pet stains and even tough urine odors. Allow this paste to remain on the stain for approximately 15 to 20-minutes, and then clean the surface as usual with your portable cleaner. Vinegar and baking soda can be used to great effect to remove most pet stains, although the smell of vinegar is not always pleasant to many people. To make a cleaning solution with vinegar and cleaning soda, then all you have to do is mix a cup of warm water with a cup of white vinegar and two tablespoons of baking soda. This mixture can be placed into a spray bottle and then sprayed upon the stain. For best results, allow the cleaner to sit for approximately 5-minutes before using your portable cleaner to remove the stain. Spot cleaning products also do a great job pretreating stains before they’re removed with a carpet cleaning. Some of the better products currently available include Folexport Spot Remover, Bissell Oxy Stain Pretreat, and Shaw R2X Carpet Stain & Soil Remover. If you follow the above guidelines, then you’ll get great results with your carpet cleaner. These cleaners are great for handling a variety of different cleaning projects, including pet stains. As long as they’re used in accordance with the manufacturer’s instructions and with a little bit of common sense, these machines can clean just about anything.